Although mainstream culture has made leaps and bounds in terms of inclusivity and body positivity (hello, Ashley Graham on the cover of Sports Illustrated), there’s still plenty of work ahead if the latest controversy surrounding Athleta is anything to go by. The Gap-owned workout apparel brand sparked criticism and backlash after using straight-size models to advertise their plus-size clothing options. While the company is know for having plus-size workout gear in sizes going up to 2X, the featured models on its online shopping pages were reported to actually be wearing a size medium. In other words, Athleta was happy to sell the plus-size clothes, but as Racked pointed out, it couldn’t seem to find the kind of woman who would actually wear them. Not cool. While Allure points out it’s common industry practice to use just a few models throughout a online store’s website, the problem is two-pronged: Not only does this not allow you to see what the clothes look like while worn, but advertising straight-size models as plus-size simply reinforces unrealistic standards of beauty for all women. While Athleta rightly faced criticism for its actions, the apparel brand was quick to apologize and admit its mistake in a statement to Health. This response is certainly a lot better than the time lululemon co-founder Chip Wilson blamed his see-through yoga pants problem on women with “fat” thighs. 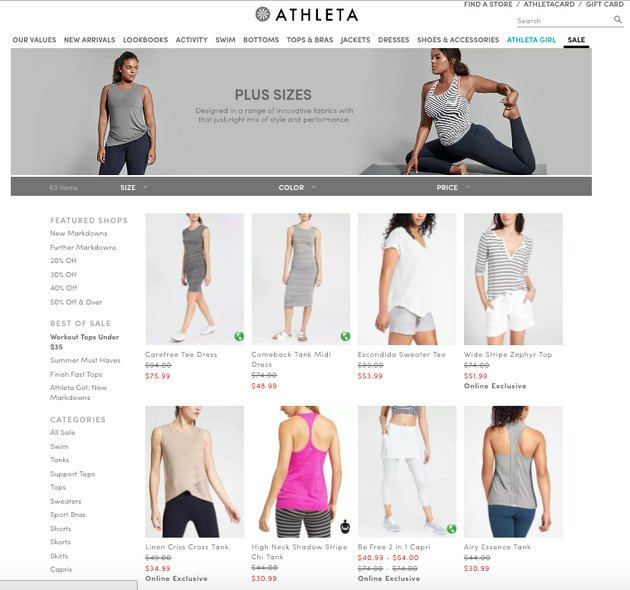 And while we’re glad Athleta apologized, it’s also important to be aware that there are companies that do a great job of representing plus-size women. Take Lane Bryant’s super chic fitness line Livi or online shopping site Torrid’s fun, flirty workout ensembles. No straight-size models trying to sell clothes to plus-size women there. Ultimately, Athleta’s track record of being body positive and inclusive should help the company live this one down. But as a lesson to other fitness brands out there: It’s a safe bet that you want to put the clothes you’re trying to sell on models that look like the people who would buy them. Do you think Athleta made a mistake? Do you think the public reacted appropriately? Do you think the company will learn from this mistake? Where is your favorite fitness apparel from? Let us know in the comments!